Now here’s a novel idea the Amish furniture builders have come up with. 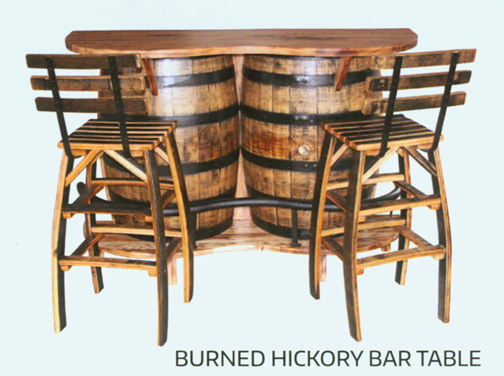 What better idea than to take an empty Jack Daniel’s whiskey barrel, cut it in half and make it into a bar table! Here the whiskey barrel is a bit lighter in tone, and then we have the solid hickory top, bottom and back that has been gently singed with a torch for a really classic rustic style. Shown here with a couple of our whiskey barrel chairs and the metal foot rest on the bottom, this is available with a variety of options and finishes to suit your decor, just give Roger a shout and tell him how you would like it to look! Table and Chairs may be purchased separately!